Designed for use with rack toms, floor toms, congas, djembe, bongos, timbales, guitars, bass cabs, brass, and more. The Fusion Series AUDIX f2 dynamic instrument microphone is designed, assembled, and tested by Audix in the USA for stage and studio applications. The Audix f2 mic has a hypercardioid pickup pattern for isolation and feedback contro. Audix equips the f2 mic with a LM (Low Mass) diaphragm for natural, accurate sound reproduction. 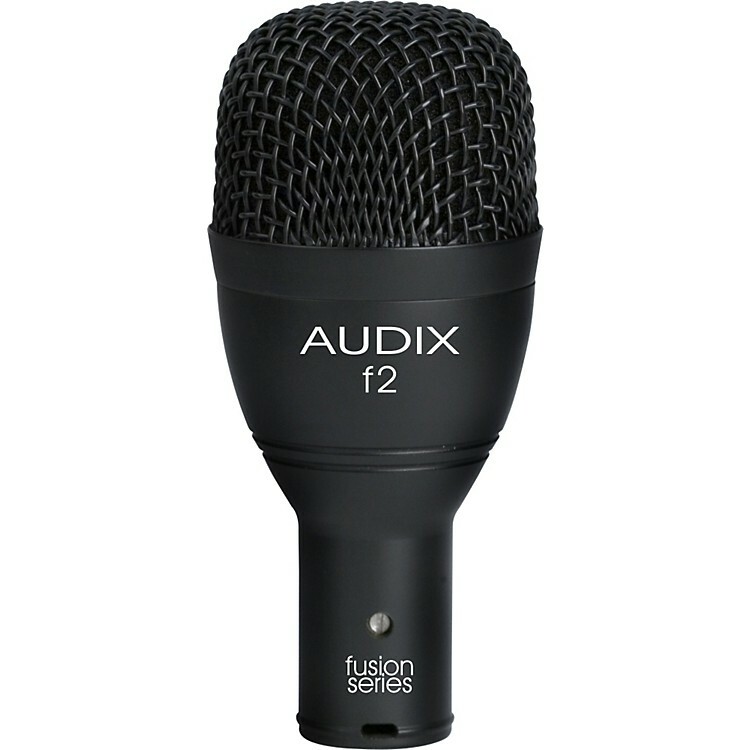 The Audix f2 microphone is lightweight, compact, and easy to position. With a wide frequency response of 52Hz-15kHz and the ability to handle sound pressure levels of 139dB, the Audix f2 is an excellent choice for preserving the attack of instruments like rack toms, congas, saxophone, guitar cabinets, and brass. Roadworthy Audix construction includes a precision-cast zinc-alloy body, black finish, laser etched model number, steel mesh grill, gold XLR connector, and a tension-fit heavy-duty-nylon mic clip. The Audix f2 microphone's ransformerless design, low impedance, and balanced output result in interference-free performance-even with long cable runs.